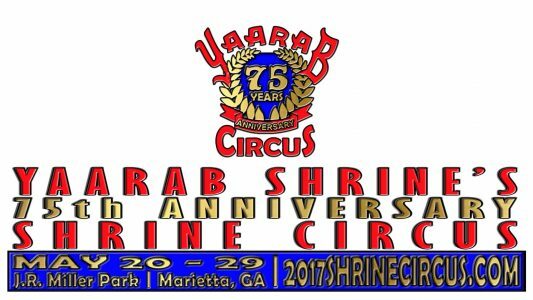 From May 20-29, 2017, the Yaarab Shrine Circus will be at Jim R. Miller Park in Marietta. With the high-flying trapeze acts, Red Devil Clowns, Sea Lion Splash Show and Kachunga’s Alligator Show, Real Steel Riders, Lew-E Comedy Circus Show, & more, it’s a fun day for the family. Bonus: On Saturday nights (May 20 & 27), there’ll be a fireworks display. On Monday-Thursday, May 22-25, $18/person buys unlimited rides. From Friday-Monday, May 26-29, unlimited rides passes are $20/person. Tuesday, May 23, is Car Load Night. With the deal, $50 covers parking, park admission, circus admission, and unlimited rides for that day only for the occupants of any car with up to seven people legally and safely buckled up in their own seat. Ride tickets are $1.25 each, and rides require 2-5 tickets. You can buy 21 ride tickets for $20, 55 ride tickets for $50, or 120 ride tickets for $100 at the gate. For a limited time, you can get advance tickets & Midway Carnival ride packages at up to 50% off at participating O’Reilly Auto Parts stores. With the deal $20 covers general admission at the gate & unlimited carnival rides on any one day. Jim R. Miller Park is located at 2245 Callaway Road, S.W., Marietta. Parking is $5.